Home Addiction Health Reviews Heroin What Is Heroin And What Are The Risks Of Heroin Use? What Is Heroin And What Are The Risks Of Heroin Use? Heroin is an extract of opium. Opium is the dried 'milk' of the opium poppy Papaver somniferum, and it contains the two strong narcotic painkillers, or opiate analgesics, morphine and codeine. Heroin (or Diamorphine to give it its scientific name) doesn’t occur naturally in opium but can be made from morphine (it is said to be semi-synthetic - there are also a number of completely synthetic opiod analgesics which may be misused such as oxycodone). The German Bayer Company was the first to develop heroin in 1898, but soon realised that it had very significant undesirable side effects. However it continues to be used as a painkiller in hospitals for very severe acute pain such as in a heart attack, when side effects can be carefully monitored. Heroin is the most commonly abused opiate. Its difficult to know how many people are addicted to it as the UK Home Office Addicts Index closed in 1997, leaving only the informal non identifiable regional drug misuse databases. At that time, there were 40,000 notifiable opiate addicts and estimates are there that numbers may have risen significantly since then, although only one per cent of the overall population are currently estimated to be heroin users. Heroin can be taken in many different ways. Heroin bought on the street comes as a brown or off-white powder (heroin, or diamorphine, for medical use comes as ampoules containing a liquid for injection). Because it comes as a powder, it can be dissolved in water and injected, or snorted through the nose. It can also be smoked. This involves heating the drug on tin foil. The fumes are then inhaled through a small tube - a method sometimes called "chasing the dragon". Injecting creates a more powerful high. The vast majority of heroin is illegally manufactured and is diluted or "cut" for sale on the street. This is usually done by mixing it with glucose, but caffeine, flour, chalk, quinine, and even talcum powder are used. 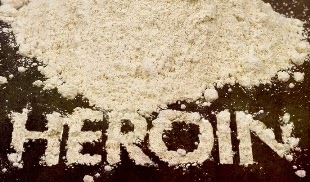 Heroin is also known by the slang terms smack, gear, skag or brown. It gives most people a 'rush' or 'buzz' within minutes of taking the drug. The effects vary depending on how the heroin is taken but users generally feel initially euphoric and then become warm, content and relaxed. They may also feel drowsy, with constriction of the pupils, slurred speech and impaired attention. Heroin can also detach the user from feelings of pain and worry. But heroin can also make you vomit, give you headaches and sometimes give you a more disturbed mood. What Are The Risks Of Heroin? Heroin is also highly addictive and tolerance to the drug builds up rapidly. This means more and more of the drug has to be used to create the same 'high'. Heroin is also relatively short-acting so a dose or “fix” needs to be taken several times a day to avoid the distressing withdrawal symptoms of painful muscle cramps, eye and nose watering, shivers and sweats. A typical habit might cost from £40-£150 a day. It is illegal to manufacture, possess, or sell heroin in the UK, and so the source and quality of the drug can never be guaranteed. This means the user runs the risk of an overdose (because the strength of the powder, and amount of heroin it actually contains, is unknown) or poisoning (because the powder has been cut with a dangerous or contaminated substance). Overdoses are frequently fatal. The other risks from heroin come not from direct effects on the body’s organs but as a result of the method by which it is taken, or from the social effects. Those who inject heroin face the risk of hepatitis and HIV infection from the use of dirty needles, as well as damage to the veins and the formation of thromboses and abscesses. This can ultimately result in gangrene, amputations and infection that spreads to the heart, bone and brain. Those who smoke heroin may develop damage to the lungs with an asthma-like condition and a severe cough. There may be progressive weight loss and malnutrition as the addict loses interest in eating, and an increased vulnerability to infections. Pregnant women who use heroin risk giving birth to smaller babies who are themselves addicted to heroin. The baby will experience withdrawal symptoms soon after birth. Jobs and relationships can become difficult to sustain, as the addicts life falls into chaos and disarray. Heavy, long-term users can experience mental health problems. Addicts often become involved in crime as a way of funding their habit. There are a variety of opinions as to how heroin addiction is best managed. The National Treatment Agency, which formulates policy for England, recommends the use of methadone, a synthetic substitute that works just like heroin, but does not provide the same euphoric effects. Methadone is usually given orally (as a syrup) but sometimes as an injection. It can be used either to maintain a heroin addict (so that they can get a regular fix without having to resort to heroin) allowing them to lead a more orderly life, or to detox or wean the addict off heroin (also known as assisted withdrawal). In this case its dosage is controlled and gradually lowered over time until the patient is off the drug completely. Some addicts say that it is more difficult to detox from methadone than from heroin itself. Another synthetic opiate called buprenorphine can also be used. A different option is to have an implant of a drug called Naltrexone which blocks the effect of heroin. This is inserted under the skin of the abdomen. However it is not yet available on the NHS and must be paid for at a private clinic.